What is Ductal Carcinoma in Situ of the Breast? Ductal carcinoma in situ (DCIS) of the breast is an early, localized cluster of cancer cells that start in the milk passages (ducts) but have not penetrated the duct walls into the surrounding tissue. The term "in situ" refers to a tumor that has not spread beyond the place where it originally developed. By definition, DCIS is a non-invasive form of breast cancer because the cancer cells are confined to the milk ducts of the breast. Ductal carcinoma in situ is sometimes described as "pre-cancerous", "pre-invasive", "non-invasive", or "intraductal carcinoma". Although, by definition, DCIS is a non-invasive form of breast cancer, if left untreated, it may progress to 'true' breast cancer by spreading into and invading the surrounding healthy breast tissue. Because doctors cannot predict with any degree of certainty whether DCIS will develop into invasive breast cancer, early diagnosis and treatment is crucial. With appropriate treatment, the prognosis (outlook) for women with DCIS is excellent. Fortunately, DCIS can often be detected on screening mammography before any symptoms develop. Ductal carcinoma in situ usually appears on mammography as an area of microcalcification (groups of small calcifications clustered together within the breast). With the increased availability of mammography, breast cancers are being detected earlier. The incidence of DCIS has increased dramatically since the introduction of widespread screening mammography. In 1983, approximately 5,000 cases of DCIS were reported, however, due to the widespread use of screening mammography, approximately 50,000 cases of DCIS are now diagnosed in the United States each year. Ductal carcinoma in situ represents 10-15% of all new breast cancers diagnosed in the United States and accounts for 30-50% of cancers detected by screening mammography in women less than age 50 and 15-25% in women over age 50. It also comprises approximately 7-10% of all breast biopsies. Fortunately, DCIS is a highly curable disease with a 10-year cancer-specific survival of about 97%. Because DCIS is a "forerunner" of invasive breast cancer, early diagnosis and treatment are crucial for reducing the risk of developing invasive breast cancer. If you or a loved one has been diagnosed with DCIS, it's critical to learn everything you possibly can about this condition so that you can make informed decisions about your treatment. That's why we created the Medifocus Guidebook on Ductal Carcinoma in Situ of the Breast, a comprehensive 167 page patient Guidebook that contains vital information about DCIS that you won't find anywhere in a single source. The relationship between DCIS and other adenocarcinomas of the breast, such as lobular carcinoma in situ (LCIS). The various types of DCIS that can be distinguised on the basis of histological features, genetic mutations, clinical symptoms, and radiographic appearance on mammography. The classification system that is used to group patients with DCIS into different subgroups and is useful for planning treatment and predicting the long-term outcome. The role of nuclear grade and specific genetic mutations, such as mutation of the p53 gene, in predicting the likelihood of DCIS developing into invasive breast cancer. The signs and symptoms of DCIS and other forms of breast cancer. Why screening mammography is the first line of defense in the battle against DCIS. How DCIS is diagnosed based on factors such as signs/symptoms, patient history, physical examination, and mammography. Prevent local recurrence of DCIS after initial treatment has been completed. Prevent DCIS from developing into invasive breast cancer. Why some women with DCIS are not considered as good candidates for breast-conserving surgery. The role of sentinel lymph node biopsy in the management of women with DCIS. The role of radiation therapy in the management of women with DCIS. New, ongoing research that focuses on identifying subgroups of women with DCIS who may not require radiation therapy after undergoing breast-conserving surgery. The risk factors that increase a woman's chances for developing local recurrence of DCIS or invasive breast cancer after undergoing breast-conserving surgery. The treatment options that are currently available for the management of recurrent DCIS. The role of complementary and alternative therapies in the management of women with DCIS. The prognosis (outlook) for women with DCIS and the important factors that have a significant impact in predicting the overall chances of recovery and survival. Quality of life issues such as sleep disorders, fatigue, weight loss, and psychological stress that can negatively affect women with DCIS and how to minimize their impact and cope better with these issues. Important questions to ask your doctor about DCIS. 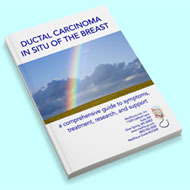 A Guide to Recent Medical Literature on Ductal Carcinoma in Situ of the Breast - This section of the Guidebook contains an extensive bibliography of over 100 references to recently published articles about Ductal Carcinoma in Situ of the Breast in authoritative, peer-reviewed medical journals with links to the absracts (summaries) of the articles. These articles represent the latest advances in the field and focus on cutting-edge research, new developments, and the lessons learned from recently published clinical trials involving patients with Ductal Carcinoma in Situ of the Breast. This is the same level of that is used by doctors who treat people with Ductal Carcinoma in Situ of the Breast to keep abreast of the latest developments and breakthroughs in this specialized field of medicine. Centers of Research for Ductal Carcinoma in Situ of the Breast - We've compiled a unique directory of doctors, hospitals, medical centers, and research institutions with special interest and, in many cases, clinical expertise in managing people with Ductal Carcinoma in Situ of the Breast. The "Centers of Research" directory is a valuable resource for quickly identifying and locating leading medical authorities and medical institutions both within the United States and other countries who are considered to be at the forefront in clinical research and treatment of Ductal Carcinoma in Situ of the Breast. You'd have to spend days - or even weeks - attempting to compile your own list of doctors and medical centers but, with the "Centers of Research" directory, the information is already right at your fingertips. All you have to do is act on the information by selecting and contacting the experts or medical institutions listed in the directory by state and country. Organizations and Support Groups for Ductal Carcinoma in Situ of the Breast - The Guidebook also includes a directory of organizations and support groups whose goal is to help people with Ductal Carcinoma in Situ of the Breast by providing access to information, resources, and services. Many of these organizations can answer your specific questions, enable you to "network" with other patients, and provide guidance in areas such as financial, social, or medical-legal issues. This valuable directory of organizations and support groups includes complete contact information, including phone numbers and E-mail addresses. 20% Discount - For a limited time, you can purchase the Medifocus Guidebook on Ductal Carcinoma in Situ of the Breast at a special 20% discount off the regular list price. Your 20% discount will automatically be applied when you go to "Checkout". Order Your Copy of the Medifocus Guidebook on Ductal Carcinoma in Situ of the Breast Today! The Medifocus Guidebook on Ductal Carcinoma in Situ of the Breast is available in the following two convenient formats: Printed and Digital. "The MediFocus Guidebook on DCIS was more than adequate for my research on this condition and I would recommend it to anyone wanting the "whole picture". Thank you for providing this excellent service." "At a very difficult time, your MediFocus Guidebook on Ductal Carcinoma in Situ helped our family make informed decisions. Thank you for your help!" "I was recently diagnosed with DCIS and was looking everywhere for information to get myself educated. The MediFocus Guidebook was very helpful in clarifying everything for me. The information is so well organized that it makes it easy to read and understand. I feel much better now that I've read this Guidebook and have a clearer understanding of the issues that I face. I highly recommend this Guidebook to anyone seeking to understand DCIS."